There is no other foundry in the U.S. that produces a piece of this quality. It takes over 35 days production time for each piece. 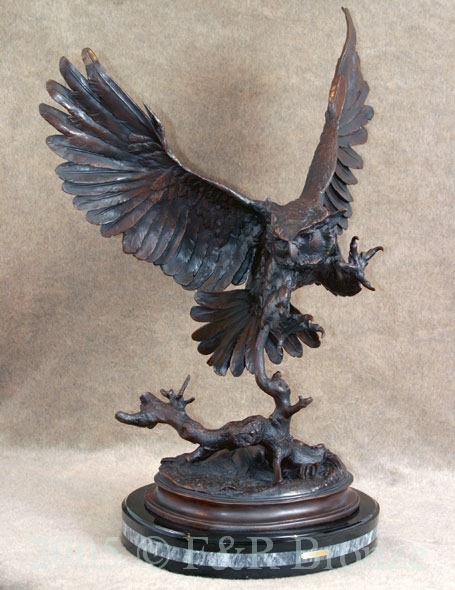 This beautiful bronze was created in the lost wax bronze casting process, is 100% bronze, and hand finished by skilled artists. Each bronze is a one of a kind. It weighs approximately 100 lbs, and is mounted on a black marble base. This fine piece retails $5,000 - $8,000 in fine art galleries. Freight is included in this price. This piece is the same as the other Moigniez Owl, but a much high quality mold and cast with richer details.